An image of a mouse brain section (left) shows the subventricular zone, the major neurogenic region of the brain. The yellow boxed area magnified (left) illustrates single cells. Those marked in red are in the proliferative phase. They diminish when Orai1 is removed. Calcium isn’t just for bones and teeth. It also has an important job in the brain, delivering signals to help neural stem cells function. But until now, scientists didn’t know how calcium got into these cells. 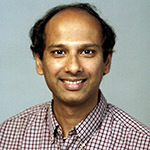 Murali Prakriya, PhD, associate professor in Pharmacology, and his lab identified the channel that brings calcium into cells to control neurogenesis, a carefully choreographed brain process in which neural stem cells replicate and become neurons. Those neurons go on to play vital roles in memory, learning and recovery following brain injury. Graduate students Agila Somasundaram, ’14 PhD, in the Northwestern University Interdepartmental Neuroscience Program, and Andrew Shum, in the Driskill Graduate Program in Life Sciences, carried out the experiments. Using neural stem cells of embryonic and adult mice, the scientists identified a pathway called the calcium release-activated calcium (CRAC) channel. It consists of two proteins: Orai1, which permits calcium to enter the cells, and STIM1, which activates the calcium once it’s inside. Scientists already knew that the CRAC channel – the pair of proteins working together – existed elsewhere in the body: it sends calcium into the immune system to activate immune cells exposed to pathogens. The lab of Murali Prakriya, PhD, associate professor in Pharmacology, discovered a new location and purpose for the CRAC channel, a pair of proteins that carry calcium into cells. This study, published in the Journal of Neuroscience, made two new important discoveries. There are many potential translational implications of this work. For instance, scientists can use it to understand how mutations in the CRAC channel affect patients’ cognitive abilities. In addition, suppressing CRAC channel activation might be a way to control brain tumor formation that is caused by runaway cell proliferation. Immune disease treatments aimed at the CRAC channel also need to consider the channel’s function in the brain. Prakriya’s lab is currently following up on these findings to see how the two CRAC channel proteins regulate the brain’s recovery after a stroke. This study was supported by the National Institutes of Health grants NS057499 and AI097302 and the Brain Research Foundation.